Wee Bear left to have lunch with one of his fraternity brothers that came into town, so I got busy. Wee Bear is allergic to peanuts, so, "while the cat's away, the mouse, did play"!! You have seen the surge of bacon with all sorts of other flavors, I still do not know why, with the health crisis in this country, that we now are adding bacon to everything? 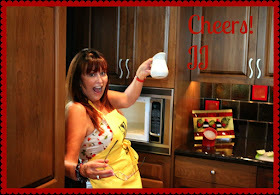 But, I always say, try everything in moderation! 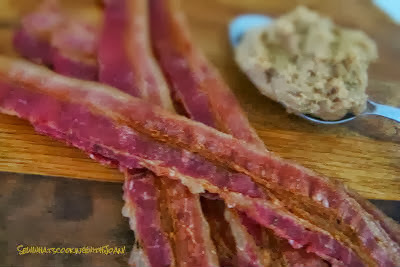 Bacon and peanut butter!? 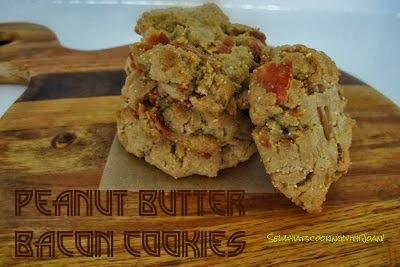 Peanut Butter and Bacon! Hmmmmm, well let's give it a go! If you have children this is perfect! Fry up bacon until cooked through and let cool on paper towels until cool enough to dice. Dice up and set aside.Preheat oven to 350 degrees F.
Grease a baking sheet with butter or use a Silpat and set aside. In a mixer combine peanut butter and sugars until well combined, about 2 minutes. Add egg and baking soda and mix for another 2 minutes. Fold in cooked bacon. Roll into golf ball sized balls and create a criss-cross pattern with a fork. You may want to roll the dough balls in granulated sugar before making the criss-cross pattern. Bake for 10 minutes, until lightly browned. Cool on a baking sheet for five minutes, then transfer to… your mouth. So how do these cookies taste? Amazingly good! 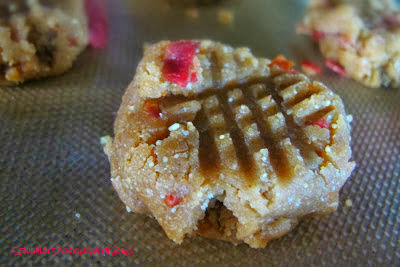 The cookie itself is a more delicate, crumbly peanut butter cookie due to the absence of butter and flour. Yes! Gluten free! The peanut butter taste is front and center. 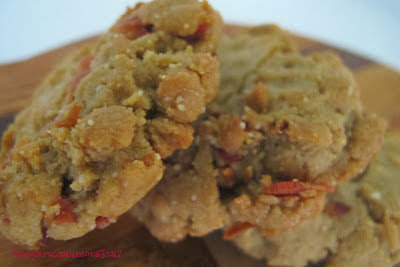 The bacon blends well with the sweetness of the cookie, adding an alluring salty, smoky, chewy bite. Perfect! Flourless, butterless, only five ingredients, and one of those ingredients is bacon. The world just got a step closer to perfect! Mmmmm I think it would be a nice combo! A "Duck" blanket using Minky! Easy Italiano pasta salad! È fantastico! Stuffed Pork Tenderloin on the rotisserie! Back to health Monday! Caprese Boats! Cornish game hens on the rotisserie! Chocolate Chip Cookies made by TINK! !